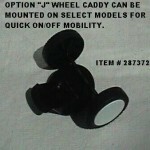 PRODUCT DESCRIPTION: The Wheel Caddy is an add on that can be fitted on select sprayers. Some of our sprayers feature a slotted base into which the Wheel Caddy fits. Once snapped on, you are able to wheel your sprayer around which is much easier compared to carrying. The Wheel Caddy can be put on and taken off your Sprayer as needed. 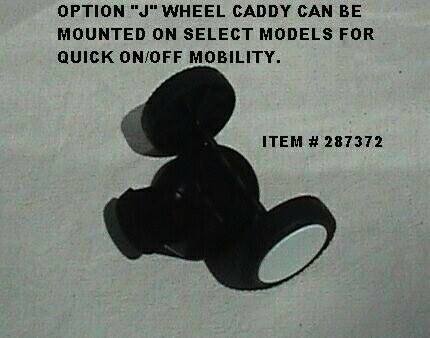 Check with your Sales Associate to insure you are ordering a Sprayer that will accommodate the Wheel Caddy if desired. If you are getting the Caddy as an add on and already own one of our Sprayers, call in to find out if it will fit the Sprayer you currently own.